Shoot it started to rain already. This really dampen my spirit as tomorrow morning there is supposed to be a hash with the designer wildgeeks in Batu Dam. If it rains tonight sure the trail will be wet and soggy one in the morning. But never mind lah at least it rain tonight and should stop raining by tomorrow morning. At 12 midnight I went straight to bed and kept thinking about the scenic view in Batu Dam. Ahh…! What a sight I am about to see ..zzzzzz!!!! Yes the alarm rang right at 7.00 am. Waking up refresh and looking forward for another great MTB hash. But wait… what’s that sound?... don’t tell me….wtf *@#!.... . As I looked out of the window, the road is wet and it’s drizzling. Sigh…! Quickly SMS Henry and Sean to confirm whether Hash on or not. Sean confirm it’s still on as the rain just drizzling. So ok la ... worse case scenario just some mud only right? So at around 7.45 am drove my car and met up with Henry and he followed my car from behind. As he near Kepong area what become a drizzle became quite a heavy rain. My heart is cursing #@*!! and quickly call Sean. Since we are already near the venue Sean suggest we have breakfast first and decide later and see whether the rain will stop or not. So good idea and me and Henry met up with Pheh, a seasoned mountain biker (he is definitely the fittest rider here) in Batu Caves and had our breakfast first while we wait for Sean’s confirmation. To cut story short, Sean decide to continue with our plan to hash in Batu Dam and all set we met up at the Batu Dam gate. At that time it’s still raining moderately. Sean arrive minutes later together with his designer gang, Karen , Therese and 2 new faces Paul and Ben. Paul had been road biking before while Ben is 1st time in off road MTB. 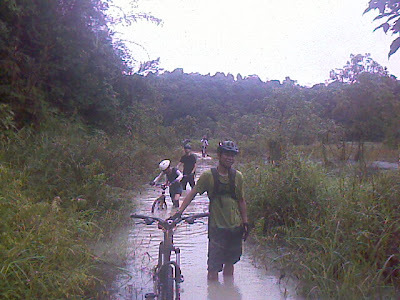 Hmm… Ben will make a good sacrificial MTB virgin in our Batu Dam River crossing induction. Heh…heh…heh…! We plan to ride in reverse being we ride along the off road lake side until the river crossing as it’s easier and then probably U-turn back so that we can avoid that killer uphill…SMART right…heh…heh…. ! So I be the hare while as usual Henry will become the sweeper. 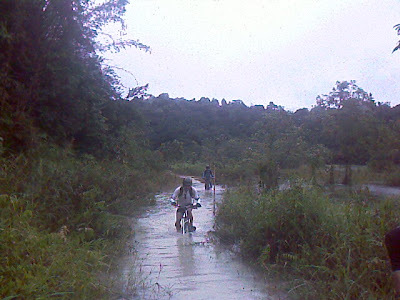 The first 1-2 KM was easy ride, though it rained but the thick tree canopy shaded us a bit from the rain. Trail is slightly slippery but very rideble until we reach our first hurdle … a 20 meter or so red soft muddy dirt road. I already expected this so some of us push our bikes while some brave one managed to ride through. 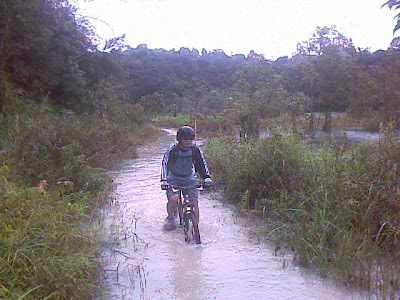 But after 2km or so from our ride we begin to see bigger obstacle in form of flooded trail. We are talking about 10-30 meter long flooded trail as deep as 0.5 meter. Apparently the bank of the lake has overflowed and flooded the trail. Some of us managed to cycle through but most have to push after attempted to cycle halfway. It was not easy cycling in water as some of the geeks may have experience in the river crossing. The problem is always not able to see what’s below the water and sometimes there might be a steep hole underneath the water and one wrong move will cause you off balance and worse when you tried to put your feet down on the ground , your feet could end up in another unseen hole beneath the water and you will end up falling from your bike and into the water. Well it happened to me …so I am speaking from experience and got my pants wet and so happen my car keys are the and it really spoilt the remote control. Luckily I did not put my handphone in my pocket. 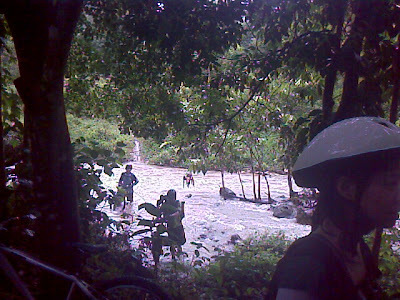 After a few flooded trail crossings, we managed to cross the first river crossing. The water current is much stronger now compared to the last time the wildgeeks last crossing there, due to the rainfall upstream. You can practically feel the river current pushing your bike towards downstream. But all of us managed to crossed through. We went the wrong way when we tried to find the 2nd river crossing and ended up crossing the wrong river. We only realized this after crossing it and did not find the trail after crossing it. Apparently I have overshot and there is a fork before that. So we make a u-turn and return to the fork and did the 2nd river crossing and have a short snack courtesy of Karen who brought some bun and chocolates . Yummy.. choc actually taste better after a long ride. After a 20 minutes or so break we decided to make a u-turn back as we want to avoid the killer uphill climb. Not that we are chicken out but the trails condition may not merit us to take such risk. Also have to give a break for the newbies mah… so that they will hash with us again. So it’s the repeat of 2 river crossing and a few flooded trails and ended up with the mud trail which causes everyones bike to get dirty at the end of the journey. Overall, this must be my craziest and wettest hash ever. Usually I would just call off the hash if there is a slight hint of raining but with Sean and Gang determination to carry on with the hash, I really have to salute you guys for the determination. Bear in mind most of them are newbies one is a virgin to MTB. Keep up this good MTB spirit guys. 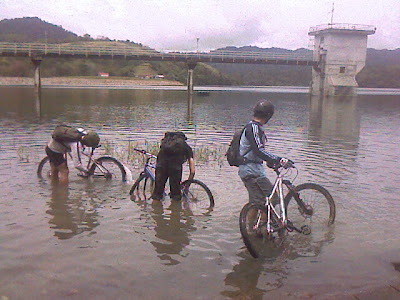 Now we all here can boast that :-WE RODE BATU DAM WHEN IT FLOODED! Well worth all the leeches and mud. Naga! Good post man... hehehe.. I really "tapek" the determination lah... LOL. hehe... cool ride ppl, you guys deserved to be upgraded from Wildgeeks to Madgeeks! Well, i was really seeing you have a lot of adventures like that. I was reacall about batu dam somewhere. I was really happy seeing your blog.